Parallel to my interest in Japanese art, I also make things. From hand-drawn illustrations to graphic design work, having a creative outlet has been an important part of my life. Since the autumn of 2013, I enrolled to the Norwich University of the Arts’ MA Communication Design course to push my interest further. While I thought I would be developing my graphics and illustration practice, I found myself working more effectively in the area of social engagement design. Social engagement design, in a nutshell, involves a number of disciplines to positively impact the knowledge a person has with a theme or product through a sequence of interactions between a user (individual person) and a system, virtual or physical. Within this design discipline, I have been particularly interested in heritage engagement. One of my key design output is the project, Walkies!. Walkies! is an innovative and powerful physical-digital engagement platform for kids and families to learn, explore, discuss and share ideas on culture and heritage using both traditional and digital communication methods. How does it work? Let’s imagine a visit to a heritage institution or site. Awaiting are a range of colourful Walkies! dogs that your children are invited to take for a walk inside the site. To start the walk, you download the Walkies! app to your mobile device and pair it with a physical Walkies! sausage dog using the QR code on the dog. This activates the engagement session. You and your children explore the physical heritage space together with the individually unique dog. The dog prompts the kids via the app to look for key objects or spaces, and photograph and write or talk about them. The children collect a series of images following questions like ‘what’s the oldest thing here’ or ‘let’s find the best spot in the city.’ Once the walk is finished, you return the dog while your children create short stories about their discoveries. These are then posted and shared on the Walkies! website where your children and their friends and families could visit and ‘like’ on the website. The posts are also pinned on the map so that the site is an interactive space to click around and see what other children are looking at. It is a simple, fun and creative way to share heritage spaces and experiences. What is particularly unique about Walkies! is that it is designed to function as a resource tool for heritage institutions. 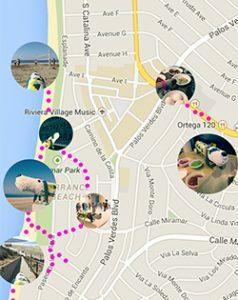 Participating institutions are able to access the information captured by their visitors through the Walkies! Analytics. They can learn more about what and how their visitors are engaging with their site and collection, and use the information to frame their activities and marketing strategies. For example, institutions can better gauge the types of collection children are drawn to and confirm if the information being promoted is relevant to their inquiries. 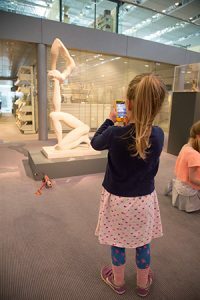 During a test trial at the Sainsbury Centre for Visual Arts, I was fascinated to learn that many children were in fact inspired by abstract monochrome images and sculptures rather than brightly coloured paintings. It was also rewarding to see children enjoying the freedom to identify their own points of interests, rather than narrowing their engagement by focusing only for the objects on a trail map. Many surveyed parents commented on the deep level of engagement and how much they enjoyed exploring the space and collection together with their children. So much so that a few days after the trial, one of the parents got back to me to say how surprised they were to remember the actual date and details of an old Egyptian pot they saw as being the oldest in the collection! Learning from each other is one of the core themes of Walkies!. Just as children and families gain more by sharing their findings, participating institutions are able to learn from each other. Institutions subscribed to Walkies! can access not only their visitor analytics but also other institutions’ too. How are children engaging in regional museums compared to national ones? How are children from different communities exploring the same historical landscapes? The project is based on a network economy where the more people participate, the more valuable the information becomes. I should stress here though that Walkies! is not a data harvesting operation in the same way that Facebook and Google are, for example, by offering ‘free’ services to make profit from data mining. Walkies! is in fact designed to be a safe and ethical alternative to the prevalent free services. It is intended to be an open resource tool that helps create a wider and more inclusive access while discovering ways to engage with heritage is transparent and in line with contemporary relevance. Walkies!, to my very pleasant surprise, has been receiving a great deal of support and design recognitions. This includes the Royal Society of the Arts (RSA) Student Design Awards, an annual international competition that drew over 770 applications from 30 countries this year alone. The project also won the Brainchild Creative Business Idea award and was shortlisted for the Deutsche Bank Award for Creative Enterprise with one of the judges, Deyan Sudjic, Director of the Design Museum, commenting on how the idea was ‘well researched and would definitely engage young audiences’. To kick-start the project for wider application, I am currently developing a more scalable dog prototype and exploring funding opportunities to develop heritage institution networks and creating the Walkies! app. The project is growing with Dr Scott Grandison, a mathematician and software developer, on board and collaborative interests from key institutions. Heritage is doubtlessly a complex and loaded term. While the concept is not without controversy, I believe that heritage has a genuine potential to enhance our lives and provide us with an intellectual anchor to shape our worldviews, adopt new thinking, and resolve our differences. Heritage is not self-sustaining. It is not something money can buy (though it helps). It is something that requires active participation and commitment to its preservation, promotion and perpetuation. I hope the readers here will share some of my excitement and be part of the Walkies! project. For those close by, please come and learn more about Walkies! at the Norwich University of the Arts’ MA Show held from 4-9 September 2015. Alternatively, please visit my website or follow the Walkies! development on Twitter @gowalkiesdog and ‘GoWalkies’ facebook page.